I recently had the opportunity to find out what happens next firsthand at a Far Cry 5 preview event hosted by Ubisoft. The company took over a ranch in Northern California and used it to create a location that could easily pass for one in the game. 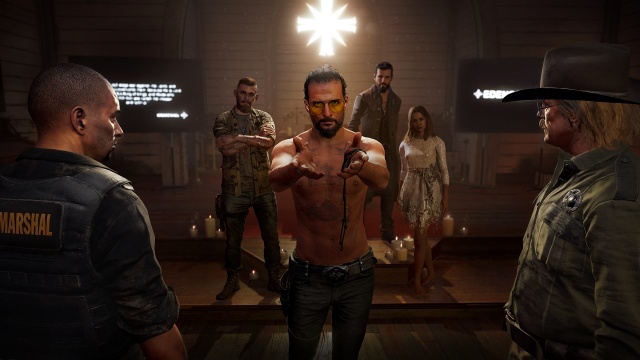 Before they had us watch the Far Cry 5 prequel short film, Inside Eden's Gate, and head into a barn to jump into the game, Ubisoft landed a helicopter at the ranch from which emerged actor Greg Bryk in full character as Joseph Seed. It's one thing to watch a video game villain in a cutscene, but it's quite another to see the villain in person giving a speech to a small crowd. It's even creepier in real life. After the live-action introduction to the game and a screening of the movie, it was time to visit Hope County itself in Far Cry 5. The game's opening mission kicks-off at the moment you extricate yourself from a downed helicopter as Seed's followers come closing in. At first alone and weaponless your goal is simply to escape the area alive, but as you do so you'll quickly come to realize how much of the area is under Seed's control and heavily armed his followers are. The opening mission is a thrilling chase that begins with you alone and weaponless in the woods and quickly escalates to a high-speed vehicle with you firing at roadblocks and tossing sticks of dynamite at your pursuers. It all ends in another crash, but this time you are rescued and spirited away by a survivalist who has been hiding out from the cult in a bunker on an island. The survivalist's island sits at the center of Hope County, and he'll brief you on the situation in Hope County and teach you how to fight back as you clear Seed's men from his island. This includes learning about the way the game structures puzzles as you try to find a way to pump water out of a flooded supply cache, how to use stealth to take out guards at small encampments, and the importance of rescuing civilian hostages from the cult. Some of the people that you rescue will provide you with some intel ' although the game takes a cue from real life and the information that you gather may not be completely accurate ' while others might direct you to members of the Resistance who are fighting Seed's cult. On occasion, someone who you rescue will even offer to fight by your side. The former hostage that I recruited while on the island proved to be an able ally, and not just because he gave me some much needed extra firepower. I was able to give him commands, so that when taking out an encampment I could order him to silently take down one guard while I took out another. When I was downed by enemies, I could rely on him to come and give me aid before I bled out. I wish I had more time to play around with the status screens at the event, because it looked like I could adjust his loadout and improve his skills as well, but I'll have to wait until the game is released before I can verify that. Another feature that I did not get much time to play around with is the crafting system. Previous Far Cry games would let you combine animal pelts into things like ammo pouches, but Far Cry 5 looks like it goes well beyond that. You can hunt for scrap and supplies in supply caches, bases, and other locations, and those items can be used to craft more than pouches. The first thing I saw was that you can create explosives by crafting and I never made it past that, quickly checking if I could make some more dynamite each time I found some new scrap. Once you clear the island, you'll open up all of Hope County for play. The county has been essentially divided between Seed's close family, and so you'll want to concentrate on reducing the cult's power on a regional basis so that you can weaken the local leader's grip on the territory and force a confrontation on your terms to fully liberate the area. If you played Ghost Recon Wildlands, then this process will be familiar to you. Only one area was open to us as part of the demo, so I'm not sure yet if you can liberate the areas in whatever order you like or if they are tough to take on until you achieve higher levels as in Assassin's Creed Origins. I can tell you that you're free to do whatever you want when you're in one of the zones - pursue major objectives, take out cult encampments, rescue hostages, or just kick back by a stream and while away your time fishing. You'll discover locations both major and minor through exploration, word of mouth from locals, and maps you'll find in enemy encampments, but you won't find anything by climbing towers. 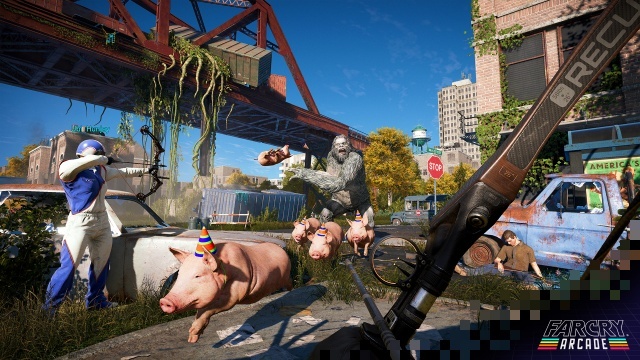 Far Cry 5 does away with this series staple, although it does take the time to poke fun at this very early on in the game when one of your first objectives is to climb a tower. One of the first missions that I took on once I moved beyond the island was to liberate a local mill. Like in previous games in the series, I was free to approach the assault however I wanted. Rather than taking on a frontal assault and risking the lives of the hostages, as well as taking a chance that reinforcements would be called in, I decided to eliminate the guards through stealth instead. Having an ally available was very helpful as I could essentially target two guards at a time for stealth takedowns. We took out most of the camp before the shooting started as one of us was spotted by a guard on a high catwalk, but the firefight was quickly over and the mill was soon mine. One of the hostages I rescued was Jess, one of the game's major NPC allies known as the 'Guns for Hire.' She immediately led me into the mountains along a trail in pursuit of the Cook, a psychopathic cultist with a particularly gruesome resume. I was pleased that my ally wasn't left behind when Jess joined me, and with Jess' deadly skills with her compound bow, the throwing knives I acquired, and my ally's ability to quietly sneak up on enemies we made quick work of the smaller camps along the way and were able to free most of the hostages without casualties. The Cook himself was another matter. Armed with a flamethrower and possessing the constitution of an elephant, the Cook presented my team with quite a challenge even before a helicopter arrived on the scene and starting raining down machine gun fire on us from above. We eventually prevailed, but it sure wasn't easy. Since my game time was limited I wanted to focus on some of the major locations in the area rather than taking the time to explore side missions or just cause havoc to weaken the cult's grip on the region, so I next focused on liberating an animal center that had until recently been home to bear named Cheeseburger who is somewhat of a local celebrity. Knowing that it was possible to earn Cheeseburger's trust and turn him into an 800 pound ally was motivation enough for me to pick that mission next (Cheeseburger is one of the game's 'Fangs for Hire'). Liberating the center was a bit tricky due to its network of animal cages, but after some fierce fighting I was able to do so. I then went to talk to one of the hostages I had freed to learn more about Cheeseburger when I suddenly blacked out, only to awaken drugged in an old hotel as the disembodied voice of a cult leader commanded me to shoot my way out of the place within a short time limit. Each failure led to an admonishment from the leader and a Groundhog Day style return to the beginning again. The Far Cry towers may be gone, but the trippy surreal levels are still here. Next we were able to try the game in co-op mode. 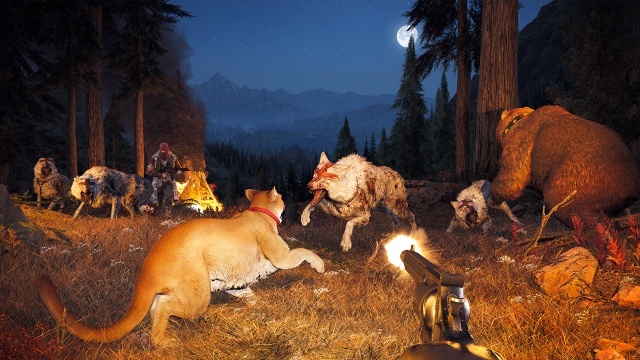 Far Cry 5 supports full drop-in/drop-out co-op play with players able to join each other regardless of how far along in the game they are on their own. The addition of human player doesn't mean that you can't have an AI companion anymore, though, so you and your partner can put together your own little squad. We took on everything from random encounters at road blocks to an attack on a moving convoy, as well as a story mission that had us free an important hostage held at a hotel while securing the location for the local resistance. That one turned out to be a microcosm of Far Cry 5 gameplay in a single mission as we started out by using stealth to take out the guards, but then had to hold the hotel against a furious cult counterattack. Luckily some heavy weapons were left behind by the cultists, including RPGs and mounted machine guns and a mortar. I used a mortar shell to completely wipe out a couple of cult vehicles just as they pulled up the hotel which was immensely satisfying. After co-op play we moved on to Far Cry 5's Arcade Mode. Arcade Mode supports community game mods, and the three games I played in this mode demonstrated the diversity of the gameplay possible. The first level was essentially an escape puzzle. You begin trapped within an old abandoned house with the simple goal of escaping from it, but that goal is not as simple as it seems. The house is straight out of a nightmare, with twisting secret passages and surreal twists on reality that will have you literally walking on the ceiling. The next level I played was a mix of shooter gameplay and a puzzle set in an industrial complex. The goal was to take out a high value target while also fighting the guards stationed at the complex, and the puzzle part was trying to figure out how to get to him. I won't give away the solution, but I'll just say it will help to approach the problem by thinking in three dimensions. While the first two levels were single player, the final one was a team deathmatch multiplayer battle set on a small island covered with the ruins of a temple complex. Three weapon loadouts are available and you can pick whichever one you want each time you spawn - nothing fancy, though, a main weapon and a sidearm for each. The relatively small map kept the action going non-stop, but multiple pathways across the island (or around it in the sea) give you a number of options to flank enemy players. The gameplay was fun in a pure, chaotic shooter sense, nothing that would compete with the multiplayer modes of the top shooter franchises, but enjoyable for its back-to-basics purity. The diversity of gameplay in the three levels of Arcade Mode was pretty impressive, and I look forward to seeing what becomes available after the game is released. I enjoyed my time with Far Cry 5 - it's always a good sign when you feel like you didn't get nearly enough time with a game and look forward to playing it again. Montana looks gorgeous in 4K, and if I had more time with the game I certainly would have stopped at times just to admire the view. Early missions in a game are often throw-away levels designed to ease you into the game, but I found the early levels in Far Cry 5 to be both challenging and interesting. Seed looks to be a great villain, not just because he is so insidiously evil and hides that beneath a veneer of gospel, but because he is a very believable character and you can imagine someone like him holding sway over a camp in the remote wilderness right at this moment. 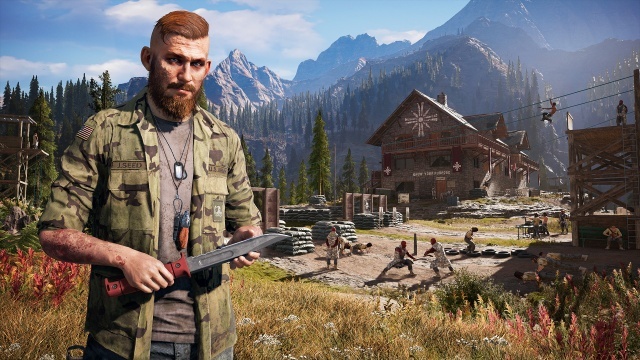 We'll have a full Far Cry 5 review after the game releases on March 27th, and I can't wait until I finally get to take Seed and his minions down. If you can't wait for the review, you can preorder the game here.